As usual, I get inspired to write about each subject on the blog from my experiences with clients. Over the weekend there were a few common themes, one of which I spoke about in an instagram live and the other I’m writing about today. Many of you may have noticed that I’m not big on recommending eye products. It’s not because I don’t believe in them because some eye products are fantastic. It’s more so that the work goes a little deeper than just an expensive skincare product. The eye area can correlate to so many different aspects of your health. Whether it stems from a reproductive, detoxification, endocrine, or simply genetic issue, the care can be tricky to uncover if you're not tapped in. 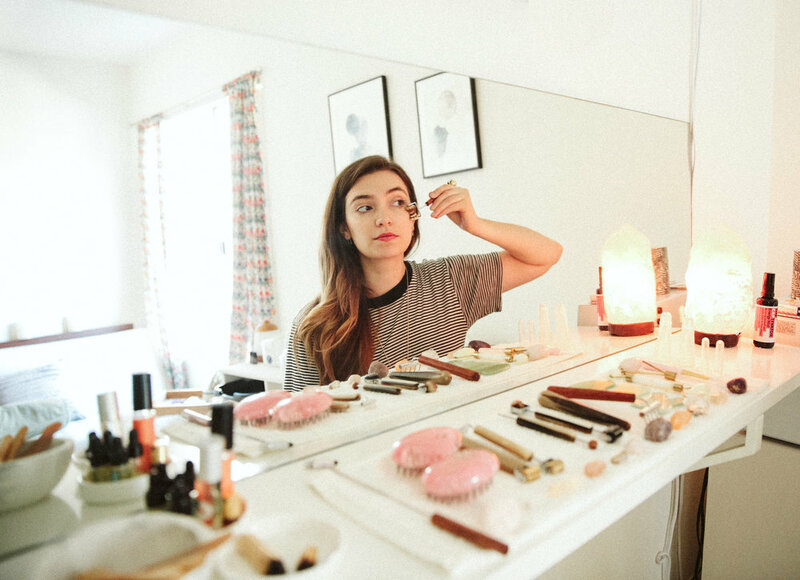 With so many great products out there formulated for just the eye area, it's important to understand that it takes just as much of the inner work to obtain the benefits of the product. Let me break down common eye area issues and what to do to help support them. Eye care has been a little frustrating for me personally because I have majorly sensitive eyes. I started wearing glasses when I was 8 or 9 and transitioned to contacts at around 13 because both acne and glasses were killing my self-confidence. I tend to get really irritated around my eyes with the wrong products including everyday makeup and makeup removers. I have a combination of astigmatism and nearsightedness so overall everything is just in a constant blur. Adding products that would sting, irritate or even fog up my eyes even more would just frustrate me. That's when I determined that the simpler the better is key for anything that comes close to my eyes. My discovery of eye care began when I was in beauty school. I remember when I was 18 in beauty school I was told the sooner you start your eye care routine the better so I have been actively treating my eyes with various creams, balms, oils, and serums for almost 13 years. The key note that I would find interesting is that our natural ability to maintain moisture in that area so we appear plump and youthful is one of the first functions of skin that starts to slow down as early as our late teens. I would always just take that concept as fact until the last few years when I started to dive into what eye issues communicate about our internal health. Are you spending too much time on your devices? Since we all started using our smart devices as part of our daily routine we have are constantly exposing ourselves to blue light which can weaken our skin cells' ability to have a successful circadian rhythm. We are tricking our bodies into going into our third and fourth winds of the day just by staring at our phones. This can disrupt the sleep patterns you need to get full restorative rest. In addition to that, the light is awful for our skin's melanocytes. You can start by turning the light low or to night light on your phone but then you can also start limiting your time looking at screens when you wake up and when you go to sleep. Are you sleeping enough? Chances are you are not. Especially if you have a lot going on in your life. Depending on the culprit of interrupted sleep, you may just need to give yourself credit here and just do the best you can. If you're choosing to avoid rest and are having any skin issues, not just the skin around the eyes, then you need to prioritize how you are spending your time. Parents, students studying for finals, and CEO's are often times the only example of why it's okay to not have gotten enough sleep (I'm generalizing of course). But there are many people who just force themselves to stay up because they are watching netflix when they really should be sleeping. Think again and get those extra zzz's as often as you can. And for those of you who menstruate, it's even more crucial to get extra sleep during the luteal and menstruation phases of your cycle. Are your hormones in balanced? As someone who has chronically suffered for adrenal fatigue for years and has had fluctuating hormone levels due to a sluggish thyroid, cervical surgeries, going off of synthetic hormonal birth control and having a miscarriage, I think I can safely talk about hormones without misleading anyone. My under eye circles are a daily reminder to work on my adrenal fatigue which I spoke about in last week's post. Don't ignore the signs of this because the alternative is much more serious than just tired looking eyes. You don't want to eventually have to cope with a much more serious imbalance in the future. How are your air quality and overall environment? The eye area is a massive indicator of what is going on in your detoxification system, specifically the lungs and kidneys. In reflexology, we find that similar shapes in the body can be a mirror to each other. So like the eyes, the lungs, kidneys, ovaries, testicles, etc. all come in pairs. There are also similarities with the shape of the eyes to the shape of the mouth, so if your eyes are dry chances are so are your lips. I like to look at all of these factors when it comes to discovering the root of an issue around the eyes. The lungs tend to be a huge one where you might experience a rash like condition due to sluggishness in your detoxification. This is why a supported immune system is essential towards bettering your eye area. Instead of adding a cream to soothe the rash, you may just need an antihistamine. Once you have scanned over those questions and tuned into your intuitive response, what comes up for you? Chances are there are a few of these factors that are part of your current health space and it’s important to realize that the eyes are merrily communicating that imbalance in order to help you pay attention. Addressing these internal and external factors first will make it really clear how to care for your the skin around your eyes. My personal favorite treatments for the eye area are a combination of water, rest, supporting the lymphatic system, and this multireflex tool. So I don't want you to think that I'm not addressing your eye care concerns when you come in for a treatment because the eyes indicate so much. What I am doing, however, is trying to navigate the internal triggers first because otherwise, it's just a waste of money and product. Since I have the most sensitive eyes, I say keep it simple and start with a non-GMO vitamin e base to help nourish the area. You can also add a drop of jojoba oil to help remove any makeup without disrupting the PH of your skin. Try to not get frustrated when signs of aging come up around the eyes as well. A little loss of fullness is very normal over time as gravity starts to take its course. Try to avoid any dehydrating foods or sugars that strip away your amino acids that cause a loss of collagen in that case. My personal tip would be to add some pearl powder and lots of carrots to your diet for a daily glow. For puffiness, you can invest in these amazing globes to cool the skin while you balance internally. What are your eye care tricks? Comment below and ask me any questions. I hope this is helpful and until next time, take care!